This article contains affiliate links at no cost to you. It’s that time of year when weekends get slammed with holiday parties, shopping, and family trips. Sometimes it’s hard to get together with the people you see and know the most, your neighbors! 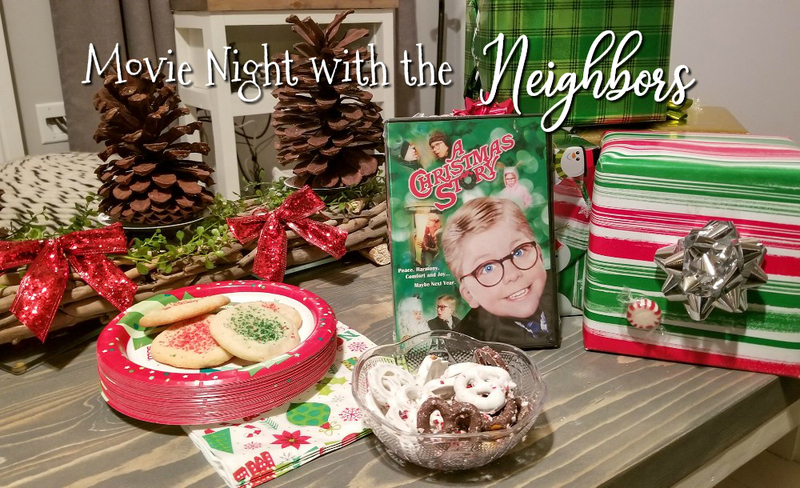 So I partnered up with Zak Designs to host a Thursday Night A Christmas Story, movie nights with some of my friends from our neighborhood. It wasn’t anything crazy, but it was still really nice to come together, have a few bites, toss back a few spirits, and watch one of the greatest holiday movies ever (with a generous side of hot cocoa and popcorn of course). So how do you host a neighborhood movie night? Well, it’s pretty simple. Have everyone bring a treat, grab a shrimp cocktail and a flatbread white pizza (drizzle it with balsamic glaze), get some frozen jalapeno poppers, and start popping the popcorn! You can make a fun spritzer like champagne and apple cider or ginger beer, cider and whiskey. It doesn’t have to be super fancy, just cozy. Don’t go bananas on garnishes and stemware, keep it simple, yummy, and budget-friendly. There are loads of easy holiday spritzer recipes on Pinterest. Even the dogs were excited to see what was in the presents! One of the great things about hosting a little shindig like this is it’s super informal, so paper plates, cups, and a few finger foods from the freezer section are plenty fine. Zak Designs sent me some presents to give to my friends and that added a really nice touch. They were super surprised and absolutely loved their gifts. They each received a Zak Holiday Sculpted Mug and loved it! Cathy and Jenn loved their mugs! Look at this Elf mug! LOVE! I think the Christmas Story mug was my favorite! Frosty is a close second. Having a good time with friends and family, that’s what it’s all about. If you want to host a little get together like this, think small. A few close friends, finger foods, a specialty drink, and a great holiday movie is just right, but if you really want to make an impression, spend your money on a special gift like holiday mugs to match the movie you’re watching. Are you looking for holiday travel ideas? Check out my favorite things to do in Atlanta, GA for the holiday season. Elf the movie with Will Ferrell is a holiday favorite that will have the whole family laughing! This Elf mug makes a perfect gift for any movie night with the neighbors! You can bundle it with the movie too! Check out these classic holiday films from Amazon guaranteed to get everyone in the mood for Christmas! Santa Claus is Coming to Town, Rudolph the Red-Nosed Reindeer, and Frosty the Snowman. You can bundle this Rudolph the Red-Nosed Reindeer mug with the classic film, or just give it as a gift to your neighbors on movie night! You can bundle this Frosty the Snowman mug with the classic holiday film, or gift it at your “movie night with the neighbors” party! Get A Christmas Story here on Amazon and have a super fun retro movie night with the neighbors! If you really want to hear the “ooos” and “aahhhs” then get this A Christmas Story mug for your friends when they come by to watch the movie! Hosting a movie night with the neighbors does not have to be stressful, time-consuming or cost a ton of money. Remember, these are the people who see you more than anyone, they don’t care if you have a catered event or just chill by the fire. Get easy foods, budget-friendly drinks, a classic movie and a special holiday gift for each of them and I assure you, they will leave your house with all the warm and fuzzies. For more fun movie night ideas, check out www.zak.com for inspiration. We all had such a good time!